Replacement of old road-mobile Topol/SS-25 missiles with newer Topol-M and RS-25 Yars is one of the key components of Russia's missile modernization program. Although the service life of Topol was recently extended to 25 years, which will allow the missile to remain in service until about 2021, it has been steadily withdrawn from service for some time now. Of the original 360 Topol missiles that the Soviet Union had in the early 1990s, about 100 appeared to still remain in force. Or maybe even fewer - according to the Ministry of Defense end-of-year report (mp4 file), 43% of the Strategic Rocket Force ICBMs are "modern systems" (it's at 6:38). It appears that to make this number work one would need to assume that the number of Topol ICBMs in service is closer to 60-70. This analytic post attempts to bring together the pieces of information about road-mobile bases and recent developments, including deployment of Topol-M and RS-24 Yars. This is very much work in progress, so comments and corrections are welcome. A note on missile unit identification: the starting point for most of the division, regiment, and military unit numbers was the Strategic Rocket Forces (RVSN)web site put together by Michael Holm. The site has a lot of good information, including the history of the Strategic Rocket Forces, locations, and names of commanders. It got a few names and designations wrong, however - the numbers below are carefully checked against various open sources - forum posts, photos, and videos. I am reasonably confident I got everything right. Most divisions use internal designations for their regiments and subunits - the 1st regiment or the 16th area (площадка). I added these names as they help better identify the units. Another extremely useful resource is the overview of the Strategic Rocket Forces put together by Kommersant back in 2009. At this point I did not include the full unit names (they are quite long and hard to translate sometimes) and did not add "Guards" to the names of Guards missile regiments. I added links to Google Maps, but to see the full picture one needs to look up the places on Google Earth (or, in a few cases, on Bing and Yandex). I hope that coordinates will help to do it easily. The missiles would occasionally go on patrol, which could last three weeks or as long as two months. It appears that each battalion can go on patrol independently, but it's also possible that a patrol involves the entire regiment. While on patrol, the missiles don't roam around - they move to a stationary position somewhere in the woods, pull on a masking net and wait for a launch order. Battalions could probably change a few positions during a longer patrol, but it's unlikely they do that, since each transfer would mean doing the "maskirovka" again, which actually defeats its purpose. We have been informed by someone whose job was to search for signs of Topols on satellite images back in the 1980s that they are virtually impossible to find (in fact, it turned out it was easier to see the foxholes dug by the protection force than the actual missiles). On the other hand, the technology is much better now - We have recently witnessed a presentation that showed how SAR images could tell you if there was a movement on a road about a day after the event, so hiding in obscure places is getting difficult. To get a sense how a patrol looks like you could find quite a few videos that show it, like this one. Now, the bases. All Topol missiles were removed from three divisions - Drovyanaya (4th missile division, Chita-46, Gorniy), Yur'ya (8th missile division), and Kansk (23rd guards missile division). The 4th and the 23rd divisions were disbanded in the 2000s, but the 4th division in Yur'ya apparently lives on. So, it will go first. In 2007 Russia listed Yur'ya as a test site for the purposes of START treaty and in 2010 it received a new commander. Russia declared 9 non-deployed SS-25 missiles at Yur'ya to the very end of the START data exchange, and apparently one of the sites - the 76th missile regiment (59.21946, 49.4256, в/ч 49567, 3 площадка) is still active. The word is that the regiment operates command missiles of the Perimeter command and control system (the missile system is known as 15P175 Sirena) - this sounds about right. The other four basing areas of the Yur'ya division look abandoned. The command missiles at Yur'ya are probably not accounted for in the New START as deployed missiles - it's likely that the base is declared as a test range, which means that all launchers there are counted as test launchers. It worked for START, so it works for New START too. The Teykovo division was the first that accepted new road-mobile missiles - Topol-M and then RS-24 Yars. In 1990, the division included four regiments with the total of 36 Topol missiles. All these regiments are still active today. The first two regiments that were converted to Topol-M are the 321st regiment (56.93211, 40.54313, в\ч 21663, 1-й полк) and the 235th regiment (56.70417, 40.4375, в\ч 12465, 2-й полк). In both places, there was construction of the support buildings - barracks and so on, but the garages and shelters remained in place and it appears that they are the same structures that were used for Topol missiles. The two regiments that received mobile RS-24 Yars - the 285th Guards missile regiment (56.80944, 40.17111, в\ч 12416, 3-й полк) and the 773rd missile regiment (56.91541, 40.30843, в\ч 43656, 4-й полк) - were somewhat different. There was no new construction at either site until about 2011 (last Google Earth imagery), although the Krona shelters were taken down in the 773rd regiment some time before September 2009. The Bing image of the regiment shows new construction activity - the garages and shelters are being built anew in new places (although the general outline of the base is intact). There are no post-2011 images of the 285th regiment, but since we know that RS-24 is deployed there, we can assume that the base underwent a similar transformation - old garages and shelters have been replaced by new ones. The 39th division is located in Pashino, near Novosibirsk. In 1990, it had three active regiments with 27 Topol missiles, but by 1994 the number of missiles reached 45 (five regiments). The number of missiles (as reported in START) was reduced to 36 in 2008, but the shelters apparently were still in place. Still, it appears that one regiment - the 826th Guards missile regiment (55.36696, 83.23493, в\ч 12423, 23 площадка) - has been disbanded. Most of the sites in the area has reasonably recent satellite shots - from September 2014. The only place where construction is visible is the 428th regiment (55.31046,83.02408, в\ч 44197, 13 площадка). Old garages and shelters have been taken down and new ones have been built. There is little doubt that this is the first RS-24 Yars regiment in Novosibirsk that reportedly began combat duty in December 2013. According to the Rocket Forces, the service received 12 mobile RS-24 Yars missiles in 2014. It's not clear if the Novosibirsk division got any of these, but it appears that they would have nowhere to go, as none of the sites look ready to accept them. There is some activity at the site of the site of the 382nd regiment (55.31745, 83.16841, в\ч 44238, 21 площадка) - dismantlement of old shelters began at some point in the 2013, but no new construction is visible on the September 2014 images. This is probably the second regiment of the 39th division that will receive RS-24 missiles, but it is not quite there yet. The other two regiments seem to be unaffected by the changes. Some sources suggested that the 357th regiment (55.32551, 82.94215, в\ч 54097, 12 площадка) has been prepared to receive RS-24 since 2012, but there is no activity at the site, so that information is incorrect. The 773rd regiment (55.38045, 82.91891, в\ч 07399, 11 площадка) was transferred to Teykovo (where is became в\ч 43656). The bottom line appears to be that there are three "alive" regiments in Novosibirsk. We know that the 428th regiment has nine RS-24 Yars missiles. As for the other two, it is likely that all SS-25/Topol missiles have been removed to make room for RS-24, but the conversion has not been completed yet. The Nizhniy Tagil division is the third division that is being converted to RS-24 Yars. The division had five regiments in 1990, but by 2009 Russia reported that only three regiments had deployed missiles. The 617th regiment (58.080077, 60.211, в\ч 12830, 12 площадка) was reportedly disbanded in 2008. The site looks quite neglected, so it is probably safe to assume that this regiment is not active anymore. The 308th regiment(58.230585, 60.67646, в\ч 54258, 21 площадка) was disbanded in 2004. The site was very much in ruins in 2009, when the last START data exchange took place, so this is the second disbanded regiment of the 42nd division. The location, however, was later used to build an entirely new base - the one that apparently operates RS-24 missiles. It is the new base that is clearly visible on the current satellite images. We know that the division received six RS-24 Yars missiles in December 2013 and more - in 2014. But let's return to the RS-24 deployment later. The 804th regiment (58.13748, 60.53811, в\ч 9430, 11 площадка) was very much intact in 2009, but had some of its shelters dismantled starting in 2012-2013. Since no new construction was visible in June 2014, it's safe to assume that no missiles, whether Topol or Yars, were deployed there in 2014. 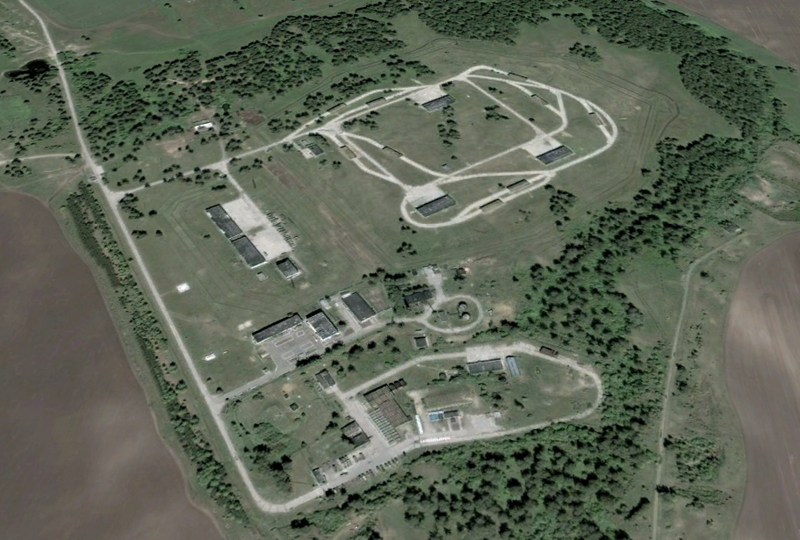 There is not much activity at the 142nd regiment base (58.19598, 60.58049, в\ч 73795, 5 площадка) - all Krona shelters were in place in May 2014. Nothing is happening in the 433rd regiment (58.10153, 60.35971, в\ч 19972, 1 площадка) as well - the most recent image there is from September 2014. So, it is not entirely clear where the new RS-24 Yars missiles that were reported to have begun service in 2014 are based. There is some construction at the division technical base (RTB, 58.10035,60.43318), but nothing that would house missile launchers. So, where are the RS-24 missiles in Nizhniy Tagil? Nine could be theoretically deployed at the new site built at the 308th regiment location (we don't know if the new regiment will retain the number; probably not). But as of the last image, 2 June 2014, the site looks pretty far from complete. Probably this is why only six missiles were deployed there in 2013. But in 2014 the Rocket Forces reportedly received 12 new mobile RS-24. These presumably were distributed between Novosibirsk and Nizhniy Tagil. Three of these 12 probably joined the new RS-24 regiment. But there is no place for the other nine to go - whether in Novosibirsk or in Nizhniy Tagil. The division in Yoshkar-Ola included four regiments with Topol missiles back in the 1990s, although the START data exchange showed that missile shelters were constructed only in three of them. One regiment was indeed disbanded and removed from START declarations in 2003 - most likely it is the 702nd missile regiment (56.597515, 48.358512, в\ч 68530). As the satellite imagery shows, three regiments of the Yoshkar-Ola division were very much operational in 2014: the 290th missile regiment (56.83194, 48.24083 in Google Maps and a better image on Yandex, в\ч 93876, площадка 1к), the 779th missile regiment (56.5825, 48.15472&, в\ч 69795, 1 площадка) and the 697th missile regiment (56.56, 48.21528, в\ч 48404, 16 площадка). There are no signs of activity at either of the three active sites (the most recent imagery is from February 2014 for the 290th regiment and from September 2014 for the other two), so it appears that they are all operational with SS-25/Topol missiles. Apparently there is a plan to deploy RS-24 Yars in Yoshkar-Ola, but so far nothing visible has been done there. In the 1990 START exchange data, Russia declared four Topol missile regiments in the Irkutsk division. Since then, one of the regiments have beed disbanded - at the base of the 345th missile regiment (52.57028, 104.80889, в\ч 40883, 4-й полк) all shelters had been removed by mid-2007. The regiments has disappeared from all social (not to mention the mainstream) media since then, so it is safe to say that it has indeed been disbanded. Of the three remaining regiments, two appear to be active - the 344th missile regiment (52.66944, 104.51972, в\ч 52933, 2-й полк) and the 586th missile regiment (52.55167, 104.15861, в\ч 52009, 3-й полк). Their shelters are intact and no construction activity is seen on the site. All indications are that these regiments still operate SS-25/Topol missiles. The 92nd missile regiment (52.50861, 104.39333, в\ч 48409, 1-й полк) is quite different. The shelters there are last seen fully intact on the 9//7/2010 image and by 9/15/2012 all shelters are gone. There is no other construction activity at the site, however. It's possible that the regiment is being prepared to be disbanded, just like the 345th regiment before it. Another possibility is that it is being prepared for RS-26 deployment, which some reports indicated will begin in Irkutsk in 2015 (it is now postponed until 2016). There are four missile regiments in the Barnaul division - the 479th Guards missile regiment (53.769921, 83.95915, в\ч 29517, 1-й полк), the 480th missile regiment (53.3059, 84.14618, в\ч 29562, 3-й полк), the 867th missile regiment (53.22468, 84.6695, в\ч 29551, 4-й полк), and the 307th missile regiment (53.31306, 84.5075, в\ч 29532, 2-й полк). The imagery of the 867th and 307th regiments is rather old - from April 2009 and June 2005 respectively. However, judging from the traffic these regiments get in various social media, the regiments are very much operational. So, it's quite likely that the division in Barnaul has the full complement of 36 SS-25/Topol missiles in service. There were no Topol missiles deployed in Vypolzovo in 1990, but by the end of the 1990s two regiments with 18 missiles were deployed there - the 41st missile regiment (57.86305, 33.65167, в\ч 14264, 1-й полк) and the 510th missile regiment (57.78825, 33.86542, в\ч 52642, 2-й полк). Both sites look well-maintained, with no signs of recent construction or other activity, so it's possible that the Vypolzovo division has 18 operational Topol missiles. There was one report that suggested that RS-26 will be deployed in Vypolzovo at some point, but it's not clear if that report was reliable. In any event, that deployment is not imminent. So, where does this leave us? First, it is easy to count Topol-M missiles - there are 18 of them in Teykovo. Also, we could say with certainty that there are 18 RS-24 Yars missiles in Teykovo as well. Two additional RS-24 regiments - one in Novosibirsk and one in Nizhniy Tagil - can be reliably identified, brining the number of RS-24 regiments to four. These have place for 36 missiles, but the total number of RS-24 Yars missiles appears to be 45: 18 in Teykovo plus 15 deployed in Novosibirsk and Nizhniy Tagil in 2013, plus 12 added to the force in 2014. Nine RS-24 missiles appear to be "homeless". So, it's probably not all that surprising that the RS-24 deployment in 2014 fell short of the original goal- the bases are not ready yet. As for the SS-25/Topol missiles, there are 14 regiments in six divisions that look like they are capable of operating SS-25. That's 126 missiles. Which seems too high - there is no way Russia keeps 126 old Topols and claim that 43% of its ICBMs are new. My guess is that quite about half of these 14 regiments are in "stand down" mode. The obvious candidates are the three regiments in Novosibirsk and Nizhniy Tagil, which are being converted to RS-24 Yars. The division in Irkutsk may also be preparing for a transfer to a different class of missiles (RS-26 in this case) - that's two more regiments. Maybe there are two others in Yoshkar-Ola and Vypolzovo, which may be prepared to convert to RS-24. But it's all just a guess at this point. The bottom line is, we assume that as of January 2015 Russia has 72 SS-25 Topol missiles in active force. This is somewhat arbitrary, but it's not a totally unreasonable assumption. We hope that we'll see more activity on these sites that would allow to make a better estimate.